The HoverCam – Splashtop Classroom Bundle allows teachers to view and control their desktop, applications and the live HoverCam image on their tablet from anywhere in the classroom. Teachers can share their desktop screen and HoverCam image with three 3 devices for the 3 user bundle package or up to 40 students’ devices - including Chromebooks and iPads – allowing them to view and control the lesson content directly from their desk with the 40 user package. 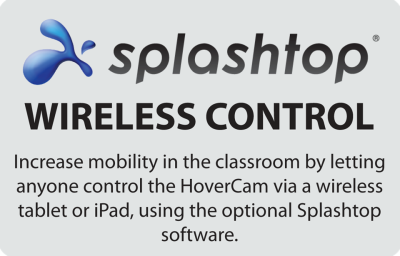 Splashtop Classroom and the HoverCam range are perfect for teachers and instructors who want to engage and interact with every student in the entire room, wirelessly! Untethering yourself from the front of the class by wirelessly connecting your tablet to your computer to view and control anything as if you were right in front of your computer. Accessing the HoverCam image and your existing applications directly from your tablet – no need to relearn or ‘buy an app for that’. Use what you already know and have paid for – even your Smart Notebook lessons and tools! 1 – Supports Chromebooks, iPads, Android devices, Macs and PCs. Your computer desktop and HoverCam image will be displayed on your tablet. You are now untethered and completely mobile in the classroom with full control over the computer’s desktop and the HoverCam image on your tablet. 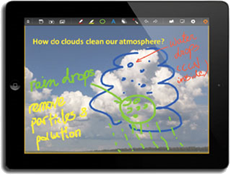 With your tablet, you can annotate, zoom in, zoom out, record, explain and interact with students. Students are initially in view-only mode – to pass control, choose the student from the teacher session manager panel Use Splashtop’s “Mirroring 360” to display the image from your tablet to the projector or large screen display without any additional hardware.